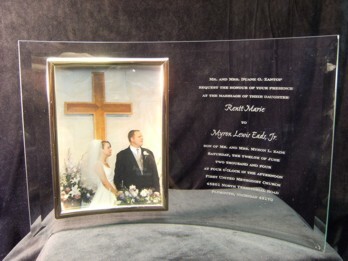 Have your wedding invitation etched into the Curved Glass Frame. Comes in Several sizes the most popular size is for the 5" x 7" Frame. Mail us your wedding invitation or scan your invitation at a high resolution (300 dpi or higher)and email to: etched@engravecon.com. Send invitation as an export format. Some export formats we can use are: tiff or jpeg. Please reference your on line order. The only additional charge is $7.00 for shipping. You may want an additional one for yourselves. The 5" x 7" is the most popular. Your wedding photographer usually gives you 5" x 7" proofs that you get to keep. Put those proofs to work that make your wedding remembered for years to come.